- The Pitt/Duke matchup might not live up to the hype tonight, but it will be interesting. I know Duke's team better than I know Pitt's, and Duke cannot deal with Dajuan Blair. Can't. Won't. Shouldn't. Just let him dunk it on you so you can sprint up the floor and jack threes. The bigger thing to watch in this one is going to be how Pitt's guards can deal with a rangy set of guards (Scheyer, Paulus, King, Smith, and, in particular, Demarcus Nelson). I'm predicting a huge night from Demarcus Nelson. That said, Go Pitt. Come home soon, Sam. Oh, and great picture. 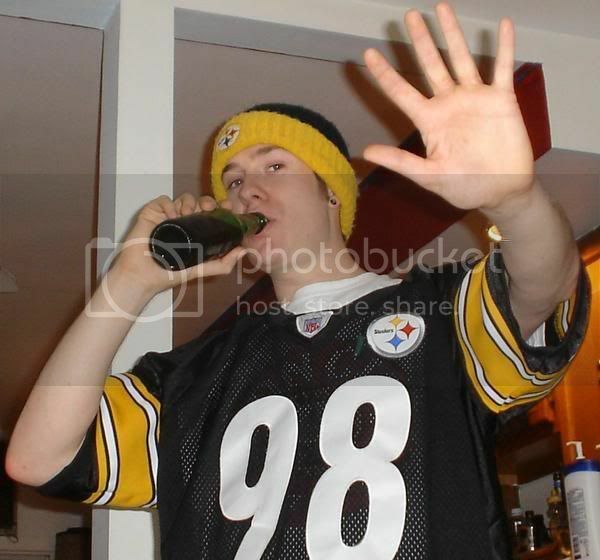 A loss tonight would probably be the most embarassing Steelers loss of the past five years. Lest we forget - we lost to the 1-8 Jets in Week 11. I think you can say we overlooked the Jets...with two losses in a row, if we aren't pumped and the defense isn't ready to knock Steven Jackson out of his shoes, it will show, to me anyway, a change in the Steelers' personality and plant the seed of doubt about Tomlin as a motivator. This loss would be more embarassing because of the Jets loss, if that makes sense. Everyone has a slip-up game every once in a while that can refocus a team. Two of those losses in one seasons means that the team isnt worth refocusing. I also forgot to mention how interesting it is that the hoops game is at the Garden tonight, a place where both teams feel at home. Pitt has been a power in the Big East tournament for some time now, and Duke plays a game in the Garden each December. Should be fun. AND...The pens play in Boston, where they used to have that awful losing streak, like, 15 years ago. It's like the planets are aligning. Why do you know Duke's team better than Pitt's? - Say what you want, but the Rams are better than their 3-11 record. Bulger, Jackson, Holt, Bruce, and Bennett represent one of the better offense we'll face, and in primetime this is there last chance to do something positive this season. - Linehan could be coaching for his job tonight. A win against the Steelers would do wonders for him. - The Steelers are reeling. In the last two weeks, we've been beat via the air (Patriots) and via the ground (Jaguars). Not sure how much confidence the Steelers D has right now. - Not only is Aaron Smith out, but Kirschke is out now, which means Eason gets the majority of the playing time. As Steelers fans we've never been concerned with the run D. It's usually always good. Be ooncerned tonight. -I realize we could go on and on picking out embarassing losses by the Steelers, but how about the loss to the Raiders last season. It was early in the year, and as you all may recall, a 9-7 record would have been good enough for a play-off spot. -That said, I dont know how I feel about tonight. It could go either way. The Steelers could put their foot down and put up 35 points, Pitt could out muscle Duke, and crosby could have the second 6 point night of his career...OR...the Steelers could come out flat AGAIN but be down 21-0 really fast, Pitt could let Duke shoot the 3 all night long, and the Pens could manage just 5 shots in two perids like they did the other night. I guess we'll find out in a few hours. First of all, I love how the stache says all of that and then still picks the Steelers to cover. I know Duke better cause Duke is on ESPN constantly and it is virtually impossible not to catch one of their games. My Mom went to Duke and raised me as a passionate fan until I snapped out of that about 5 years ago. I still know their teams pretty well each year, though. Haven't had a chance to watch Pitt as much. My mom actually went to Duke also, but even she can't defend their smug, racist basketball team.